The sometimes-murky world of cryptocurrency just got a little bit clearer. Coinbase, the world’s most popular bitcoin tool, has launched the first licensed exchange in the United States for the virtual currency, with the goal of bringing increased stability to the bitcoin ecosystem. With Coinbase Exchange, users in 24 states will be able to trade bitcoins for cash in a venue backed by investors including the New York Stock Exchange. The company is working to win approval from regulators in others states as well. Bitcoin is the most popular of a host of peer-to-peer digital currencies that have sprung up in the past few years. 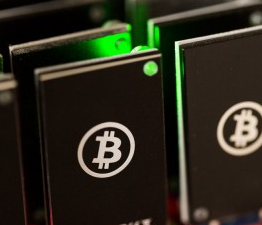 A growing list of retailers has begun accepting bitcoins. But the currency is not backed by any nation or other government entity, and its value has been hammered on occasion due to shady online dealings. Mt. Gox, a popular online bitcoin exchange based in Japan, essentially vanished last year, taking about a half-billion dollars of investors’ money with it. Like other cryptocurrencies, bitcoins have struggled under an association with an Internet black market in which drugs and other illegal goods and services are sold, and where digital currency is preferred because of the anonymity it allows. After peaking at more than $1,200 in 2013, a single bitcoin is now worth roughly $240. Coinbase will make money by taking 0.25 percent from each transaction. Transactions will be free for the first two months, according to the company.